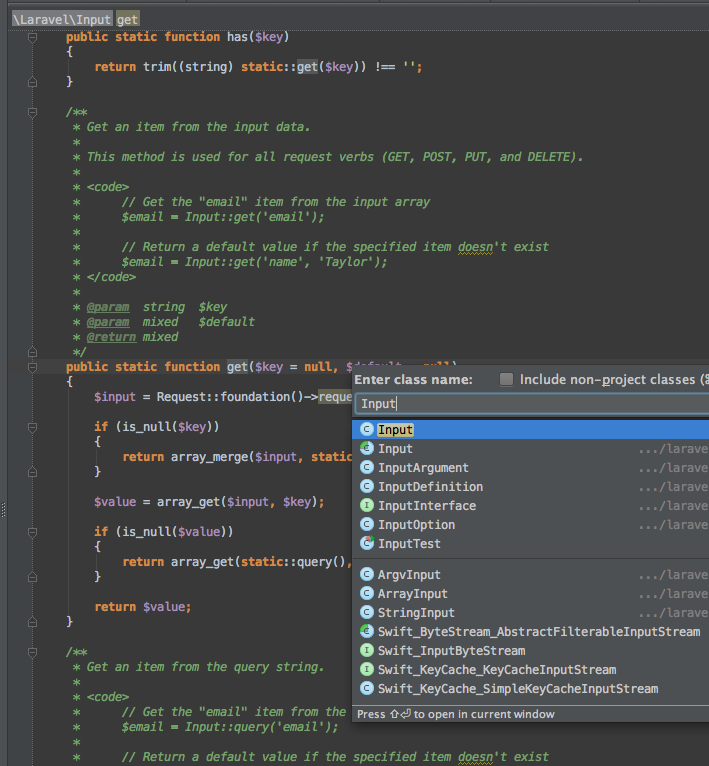 Longtime Java dev, so I'm used to using Eclipse and clicking through objects, seeing the class inplementations and comments as well as auto complete on methods. It seems with PHP Storm (and PDT/Sublime etc.) that autocompletion is really limited. Please show FULL content of such problematic file. Please see my updated answer. 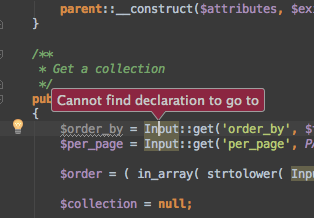 The code completion in PhpStorm (and other tools mentioned by you) is NOT limited in this regard -- it's the way how this particular framework built/works (class autoloading). There is no "Input" class at all -- the proper FQN is "Laravel\Input"
Because of that, you need to tell IDE what "Input" class really is. The aforementioned "helper" file will solve it. Thanks a lot, that helped a lot. Ctrl+Click does take me to the ide_helper.php file rather than the implementation class directly but I guess it's liveable. One downside of the autocomplete though is that PHPStorm adds the full namespace rather than the shortened format which Laravel supports.